At a young age, Artist Rosalie Lopez experienced the realities of loss, addiction, and violence. Raised in South Los Angeles to a Chicana mother and Mexican father, many of the issues facing brown communities were reflected in her family and home-life. Her uncle, a talented artist who influenced her love for art, passed away of an accidental drug overdose when she was a child. Before graduating with her MFA, she was also plagued by the loss of her mother to cancer as well as her brother’s substance addiction. Nonetheless, the impact of her loved ones is reflected in her value of community and Chicano culture within her artwork. While she has grown into an established printmaker whose work has been featured in several exhibitions, her early childhood experiences continue to shape her perspectives of society and art-making. Lopez is passionate about giving back to her community by sharing her experience and resources. She is currently a visiting artist with the Arikara Community Action Group, located on the Arikara Nation's reservation in White Shield, North Dakota. She teaches screen printing and coordinates programming for summer arts initiatives for indigenous youth at the reservation. She wishes to see young people of color work hard to achieve their dreams that the seven generations before them sacrificed to have in their lifetimes in present day. Rosalie’s 2017 Dia de Los Muertos commemorative print for SHG, “Her Hands Remind Us,” serves as inspiration for just that. The image is modeled after a miracle charm used in Mexican culture, the milagro. When there is a need for healing or the redemption of a person, animal, or object, the milagro is worn or mounted on an altar before prayer. 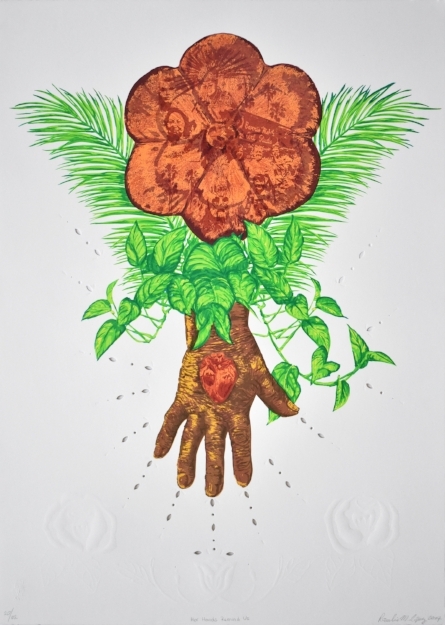 The object used in this commemorative print is a flower, signifying the plants Lopez and her sister inherited after their mother’s death. The flower is located at the top of the serigraph encapsulating that moment. It depicts images of the indigenous roots of Dia de los Muertos and the beginning of the Self-Help Graphics & Art tradition of the Barrio Mobile Art Studio that Sister Karen and Linda Vallejo collectively used to revive Day of the Dead in Los Angeles. Also included are images of muerto masks and two of Rosalie’s loved ones who have past on, her mother and her brother. Below the flower is a Golden Pathos/Devil’s Ivy houseplant, used as a symbol of a living moment. Lopez’s mother was a lover of all things nature, and since inheriting her plants she enjoys propagating them as gifts to people. Rosalie keeps her mother and brother’s spirits, amongst others, alive and present in her art and in the works she does throughout her community.